Dominicans are rightly proud of their island and its natural wonders - it is a beautiful and largely unspoilt island with rainforest, hills and a coral coastline. It can be a bit rough around the edges and run-down in places but the people are genuinely friendly and welcoming and they speak English. They have a population of about 70,000 and an amazing 40% unemployment rate - yet they still smile a lot! We arrived in the main town of Roseau on 2nd February, planning to stay for a few days and ended up staying for two weeks. On our first day, we teamed up with 3 Germans and an Austrian from another boat and went for a mini-bus tour of the island. Our driver Brendan and our guide Patrick were a great laugh and showed us many of the highlights of the island. Carib lady and one of her baskets. First stop was the Carib village on the far side of the island. The Caribs were the original inhabitants of the Caribbean islands before Columbus arrived. Although warlike, they had no chance against European killing technology and were displaced and in some cases killed off. 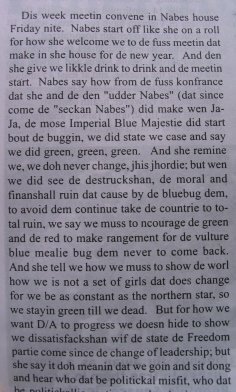 There are very few Caribs left nowadays. However, the Caribs did pretty much the same thing to the Arawaks who were there before them AND they used to eat them too! Their facial features are somewhat oriental looking. Nowadays they live mainly from selling basketwork, which they are expert at making. 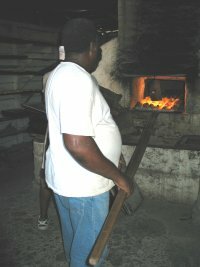 The wood-fired bakery where we bought some delicious smokey bread. Tom (eating bread and drinking the local beer), Anya, Christina, Wolfram, Guido, and kneeling in the front Patrick and Brendan (these Irish fellas get everywhere!). 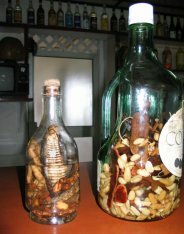 The local rum can sometimes have a bit of a bite to it - the one on the left contains a cobra (for virility guys!). Tom tried the one on the right .... just beans (for wind maybe?). Eastern Caribbean currency features Queen Elizabeth the Second on the face and caravelles on the obverse side of the larger coins. During that first day we had a glimpse of just how fertile Dominica is - we saw things growing everywhere: mangoes, pineapples, cacoa, coffee, breadfruit, coconuts, bananas, etc. The climate is warm and there is plenty of rain, especially on the hills, so stuff grows! And beasties grow big too - one night, while rowing the dinghy out to the boat in the dark, Sue felt something climbing up her leg. It turned out to be a 5 inch long centipede and it gave her a wee bite before we gave it swimming lessons! Ugh!! Cooling off in the Layou River. Next day, we went diving in warm water for the first time. We are used to diving in Scotland with thick woolly-bears (fleece "overalls") inside dry-suits - the lightweight gear used here was so easy and comfortable that we wonder how we'll ever manage to dive in cold water again. During the next two days we did a total of four dives. The corals, sponges and colourful fish were spectacular. Blackbar Soldierfish and Barrel Sponge. Highlights of our dives were the wee orange seahorse that we saw on the first day (didn't have the camera unfortunately) and the undersea volcanic vents which produce bubbles and hot water from the seabed. While we were in Dominica the Queen Mary II, the biggest cruise ship in the world, called in on her maiden voyage. To mark the occasion, the Dominicans staged a preview of their carnival parade. 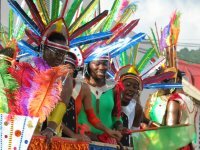 The carnival music in Dominica is calypso (played on massive speakers on the back of lorries) and every year just before carnival there is a competition to choose the best tune. While we were there the new calypsos were played everywhere, again and again and again... Our favourite ("We live on animal farm dum de dum de dum bum bum dum...") became the eventual winner. Peeky (left) and his brother Ken. We also got talking to a great character called "Peeky the Poet" who was calypso champion 4 times and sang us a few of his compositions. 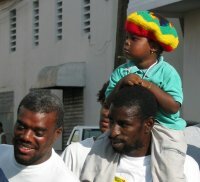 We bumped into Peeky a few times while in Roseau and he was keen that we enjoy our time in his beautiful country. 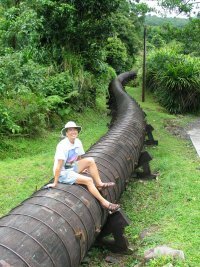 We made another couple of trips into the rainforest, one to Trafalgar Falls and the other to Titou Gorge. We found that it rains a lot in the rainforest, which makes for spectacular waterfalls and gorges but also makes you wet and your shoes squelch! A great view of a rainforest gorge from the cafe where we had lunch. After two weeks, we resisted the temptation to hang around for carnival (Peeky even offered to make us costumes for the parade!) and headed north again, stopping overnight further up the coast before sailing across to the Isles des Saintes, just south of Guadeloupe. Available in all good supermarket freezer cabinets - pig ears! 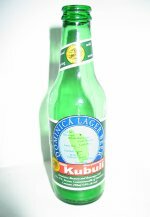 Kubuli Beer - "The Beer We Drink" is the slogan, so we did!